Skin traction is used for femoral shaft fractures before cast immobilization or operative fixation and for preoperative management of unstable proximal femoral epiphyseal slips. Home traction programs have been used for preliminary traction in DDH management and in home management of femoral shaft fractures. 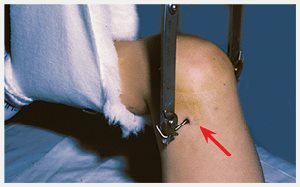 The common uses of traction include supracondylar humeral fractures, femoral shaft fractures, subtrochanteric fractures. Traction is sometimes used to improve motion in Perthe’s disease or chondrolysis of the hip. Whether the improvement is due to the traction or simply the enforced bed rest and immobilization is unclear. Complex spine problems, such as congenital and neuromuscular deformities, are sometimes managed by a combination of traction and surgery. Inflammatory hip disorders Avoid traction in inflammatory hip disorders such as toxic synovitis or septic arthritis. Traction often positions the limb in less flexion, external rotation, and abduction, resulting in increased intraarticular pressure and possible avascular necrosis. Overhead leg position Avoid Bryant traction in patients weighing more than 25 pounds because the vertical positioning may result in limb ischaemia. This traction is seldom used. It is preferable to reduce the flexion of the hips from 90° to about 45° to reduce the risk of ischaemia. Proximal tibial pin traction Avoid proximal tibial skeletal traction, as distal femoral traction provides greater safety. Reports of recurvatum deformity and knee ligamentous laxity make proximal tibial pin traction risky. Skin irritation This is common under skin traction. Prevent this problem by avoiding excessive traction or compression. Frequent inspection of the skin reduces this risk. Nerve compression This most commonly involves the peroneal nerve from skin traction. Avoid excessive pressure over the upper fibula. Vascular compromise This complication is associated with overhead traction for femoral fractures in infants more than 25 pounds. Physeal damage from pins This complication has been most common from upper tibial pin traction. Cranial penetration of halo pins The thin calvarium in children makes inadvertent penetration a risk. The risks are reduced by using more pins with less compression. Preapplication CT studies may be helpful in determining proper sites for pin placement. Superior mesenteric artery syndrome This serious complication may result from long periods of supine positioning in poorly nourished individuals. Hypertension The mechanism is unknown. Skin traction was one of the first management techniques in orthopedics. Currently, skin traction is primarily used in managing trauma. The use has declined but still finds occasional application. Initial management Buck traction provides temporary alignment while awaiting definitive treatment. Current indications include femur fractures prior to early spica cast application or operative fixation. Unstable slips may be managed by initial skin traction while awaiting internal fixation. Definitive management Russell traction is the traditional standard for management of young children with femoral shaft fractures. Bryant overhead traction was used for managing femoral fractures in infants. Because of the risk of vascular compromise, this treatment has been abandoned. Dunlop traction is sometimes used for managing supracondylar humeral fractures. Fractures with operative contraindications Excessive swelling, fracture blisters, or infected skin wounds may contraindicate or at least delay internal fixation. Temporary cervical traction Head halter traction may be used for the initial management of acute torticollis and rotatory subluxation. Apply adhesive to the skin as necessary. Apply padding to the malleoli or bony prominences before applying the traction tape. Apply traction tapes of fabric-backed foam to the skin. Select a large size to reduce the load per unit area. Overwrap to secure traction tapes. Apply evenly with limited pressure. Avoid using the whole roll of material. Use only one or two layers of overwrap. Cut off and discard unused material. Apply weight carefully, just enough to align the limb. Insert spreader to avoid pressure over malleoli or wrist. Place supports for the elevated limb. This may be a pillow under the knee or slings with separate support. Consider possible complications. These include blisters under the traction tapes or wrapping, or excessive compression, causing excessive vessel or nerve compression. Careful application, avoiding excessive compression and traction, and good nursing care will minimize risks. Skin condition Inspect the skin condition under the overwrap daily for the first few days. Neurovascular status Inspect daily. Check dorsiflexion of the great toe to assess peroneal nerve function. Apply traction directly to bone. Modifications include single or multiple pins, use of eye-screws (upper tibia and proximal ulna), and pins combined with special frames (halo traction). Skeletal traction is usually selected over skin traction when greater weight or duration are required. The most common indication is 90°-90° traction for management of proximal or shaft fractures of the femur, olecranon pin traction for supracondylar fracture management, and spine traction through a halo-pin combination. Traction bow Select a traction bow or frame. Bows may be simple, to just support the pin, or specially designed for small-diameter pins. Pin selection Select a pin that fits the traction bow. Smooth pins are more easily inserted and removed but may slide in the bone. Smooth pins may be inserted with local anesthesia and removed in the clinic. Threaded pins usually require more sedation or a general anesthetic for application and removal. Site for insertion Avoid growth plates. For femoral fractures, apply in the distal metaphysis, usually at the level of the superior margin of the patella. Position of limb during insertion. Avoid tenting of the skin or fascia by holding the limb in the position required for treatment. Skin preparation Use 1% iodine or equivalent. Anesthesia Inject local anesthetic agent into the skin fascia and periosteum at the sites of entry and exit of the pin. Place the pins at right angles to the axis of traction. Release skin, if tented, with a pointed scalpel. Some recommend an antibiotic ointment around the entry and exit of the pin through the skin. Apply dressing to protect pin sites. Apply traction bow Narrow the bow to reduce the potential for side-to-side movement on smooth pins. Apply stops of felt or other material if necessary to avoid sliding on the smooth pin. Apply weights to support the limb. Inspect and clean pin sites daily. Should pins become inflamed or infected, first relieve any tenting of the skin or underlying fascia, culture wounds, and administer antibiotics as necessary. Cut the pin at the skin level on the exit side. Remove the pin with a drill. Place a protective dressing. Divide adhesions between the dermis and underlying fascia with a pointed scalpel. This frees the skin and allows subcutaneous fat to fill the space between the skin and fascia, reducing the risk of a residual unsightly depressed scar.